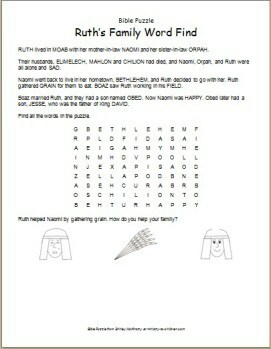 Review the story of Ruth with a word find puzzle containing the important words in the story. RUTH lived in MOAB with her mother-in-law NAOMI and her sister-in-law ORPAH. gathered GRAIN for them to eat. BOAZ saw Ruth working in his FIELD. son, JESSE, who was the father of King DAVID. Find all the words in the puzzle.